Atlanta. 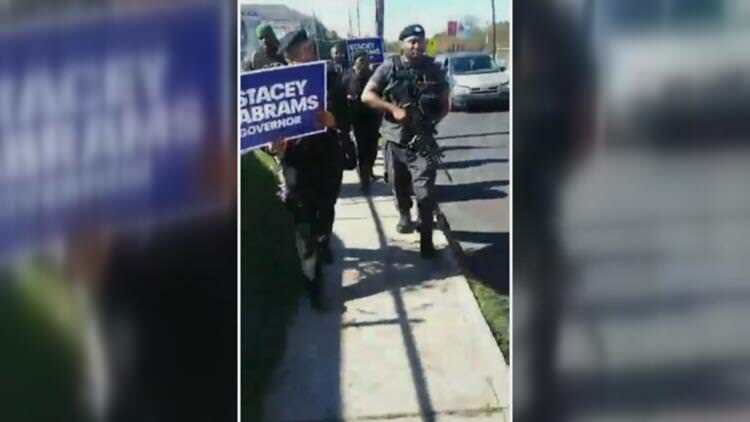 GA (CBS46) A picture posted to social media showing members of the new Black Panther Party holding guns and a Stacey Abrams campaign sign has a lot of people talking. The picture was posted on the group's Facebook page and the caption says they're "not working with any campaign --but rallying against voter suppression." Republican candidate Brian Kemp's campaign posted it on Twitter and sent CBS46 a statement. "It's no surprise that militant Black Panthers are armed and patrolling the streets of Georgia for Stacey Abrams. The Black Panthers are a radical hate group with a racist and anti-semitic agenda. They are dangerous and encourage violence against our men and women in uniform." However, Abram's camp responded, saying it's Brian Kemp who "posed for pictures with supporters wearing racist, hate-filled shirts and refused to denounce them." Polls open for Election Day at 7 a.m. I hope the Democrats get absolutely spanked. IMO, there were a few bright spots for Republicans and one was Stacy Abrams being defeated (even if she is unwilling to admit it). Too bad, Oprah! They are cheating in Broward County again. Hopefully DeSantis will fix Florida's system once and for all. Gov. Scott has ordered the State Troopers to seize all outstanding ballots. S. Florida is corrupt beyond words. Yep the dems are hard at work trying to steal the election. Talked to my Dad earlier. He said the Houston area GOP has been decimated. Like someone sent in a Trojan horse full of invading Leftists. I foresee violence around the corner.